ABC came in high, CW isn't even on the board, and FOX tanked. CBS and NBC are surprisingly equal, but we'll see how that pans out. I picked more shows this year than I did last year, but a few of them I really don't think will make it to Thanksgiving, so not much is lost in giving them a try. For ABC, I'm going with the soon-to-premiere Single Parents (a bit too much exposure, already, I think), A Million Little Things (it better be better than Friends with Better Lives), plus the farther out The Rookie (Nathan Fillion, anyone? ), The Conners, Schooled, and The Kids are Alright (it seems that we're on an every-other-year-there's-a-Catholic-family-show module). As two of those are spin-offs, I'm not really feeling like my ABC selections are as high as they appear. For FOX, the only thing I'm going to bother with is Rel, which starts tonight. It's about a guy who has to rebuild his life after a divorce, so it'll be a rough start, but Sinbad plays the protagonist's father, so that could be fun. On NBC, the start dates are mostly soon. In September alone, I'll be checking out New Amsterdam (I'm a sucker for medical shows), I Feel Bad (I need more "mom shows"), and Manifest (it's going to be awful or amazing), plus later on there's Gilded Age (period show! ), Abby's (this looks like a hot mess), and The Village (which, really, I'm only in to see Daren Kagasoff act again). Rounding it out on CBS, there's the crazy (unscripted) Million Dollar Mile, the unlikely-to-work Happy Together, the reboot of Murphy Brown, the too-much-like-Living-Biblically-from-last-season God Friended Me, the is-this-Timeless-again? Blood & Treasure, and the Beth-Behrs-is-back The Neighborhood. The bigger, scarier thing (if you can believe it) is that I have a TON of returning shows, which I don't think I realized back in Spring! Other Networks: South Park (Comedy Central), Grown-ish (Freeform), Good Trouble (the Freeform spin-off of The Fosters), plus the aforementioned follow-an-atypical-family shows I enjoy. And, at some point, I still do plan to check out The Mick and Good Girls. 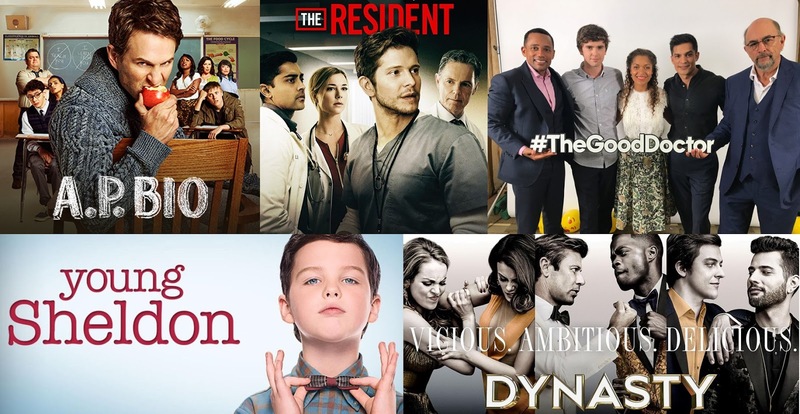 So... yeah, there's a lot of television entertainment to be enjoyed this year. 2017-2018 Network Prospects: Why Not? Where have I been? Well, around the time of the last post, I excitedly became pregnant. Later that month I signed a large contract for my other occupation that kept me very busy, from that point until about five months after the babies were born. Then, we moved across the country, and I have been filling my days with everything that goes along with navigating a new area (while learning to parent twin toddlers). I'm not entirely sure what my blogging plans are at this point (I'm not sure if I have any press contacts left out there), but I've been looking forward to the new television season for several months now, and want an outlet to talk about the prospects. I didn't really ease up on my viewing, and have largely stayed up-to-date with all of the series I followed before (both broadcast network and cable). I actually even began a post last year, planning to discuss those pilots, but I never got around to finishing/publishing it. Anyway, let's dive in. Expect my thoughts to be scatterbrained, as I'm rather out of practice at this point, and am more in the mindset of having fun than editing. ABC: The Good Doctor, Kevin (Probably) Saves the World, Ten Days in the Valley, The Crossing, Deception. 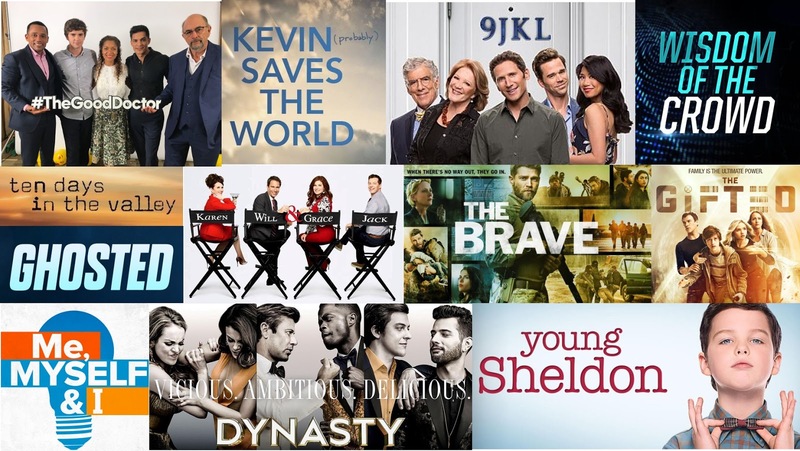 CBS: 9JKL, Young Sheldon, Wisdom of the Crowd, By the Book, Me, Myself, and I. FOX: The Gifted, Ghosted, The Resident, LA to Vegas. NBC: The Brave, Good Girls, Rise, A.P. Bio, and the return of Will & Grace (not really a pilot, per se). ABC: Fresh off the Boat, American Housewife, The Middle, Speechless, The Goldbergs, Black-ish. CBS: Man with a Plan, Trial & Error, How to Get Away with Murder, Code Black, Scorpion, The Big Bang Theory. The CW: Jane the Virgin. NBC: Timeless, This is Us, Superstore. Low on FOX, very heavy on CBS and ABC (I've been particularly drawn to ABC's programming as long as I can remember), average for NBC and The CW. This is where I really start to get fired up and want to talk about the season! If we didn't have the technology to record multiple shows at once or to access them outside of the original broadcast, I'd be doomed. Not looking specifically at the different timeslots within primetime, I could be in some trouble. Four on Sunday night is weird (while four on Thursday night is expected), and six on each of Monday and Tuesday is insane! Five more on Wednesday means I would constantly be struggling to keep up at the water cooler by Thursday morning, but at least a measly one on Friday night would make it easier to plan movie nights to go see the latest soon-to-be-blockbuster. However, we're fortunate enough that we can watch three "hours" of television in just about two, thanks to the magic of fast-forwarding. And, in my own case, I don't see movies on their opening nights anymore; the amount of coordination that takes doubles when factoring in childcare! If you're a longtime reader (not sure if any of those are left, honestly), you know that I always try out a large number of new shows in the fall, so a dozen does not scare me, but an additional 13 returning series really start to twist my mind a bit. 25 series to watch at least 2-3 episodes of (not factoring in which are sixty minutes rather than thirty!) makes for a bit of a daunting October (the fact that it's taking forever for shows to start is an entirely separate issue...). And that doesn't factor in which shows my husband will choose to watch with me (of the returning fall series, he's only a fan of Scorpion, Superstore, How to Get Away with Murder, Man with a Plan, and Bob's Burgers), and which he'll need time to view on his own (he really only picks three or four pilots each year, but they're generally different from my own choices). Fortunately, my boys are phenomenal sleepers, so between their almost-three-hour nap and the eleven hours they sleep at night, I think I can fit it all in. I guess only time will tell.